The popular alternative music podcast required a different solution to distribute their content. Historically That’s Not Metal’s premium content was only available through their Shopify store. Subscription customers would have to “purchase” a £0.00 priced item to download the content and send it to their devices, which was all less than ideal. iTunes was never an option due to the cut they take on every purchase and subscription. 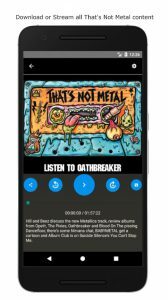 A system which allows TNM to host and distribute their own content so that paying customers can access their podcasts on Android & iOS and the Web. Content hosted in Amazon S3 for high-speed downloads globally. Distributed through Amazon Lambda for speed and scalability without paying for redundant capacity. Requires a balance between affordability and scalability.